while someone else's alien device, implanted in his body, controls his life. A boy named John, searching for scrap in the park, finds a glittering Golden Heart, palm sized and shaped like a starfish. When he puts it into his shirt pocket, the Heart automatically implants itself into his body. Now the Heart begins to study him, and slowly, it begins to enhance his talents, and his inclinations. Unfortunately, for John, it also triggers a signal to transition to a new world, ruled by the makers of the Hearts. 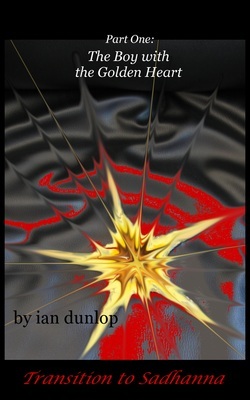 THE GOLDEN HEART﻿ is a novel in progress, and you are invited to watch it grow. Part One: ﻿TRANSITION TO SADHANNA﻿ recounts the capture of John by the Golden Heart and his journey to the world where this Heart was conceived. Along the way we are introduced to the major characters, landscapes and cities of the world. And concurrently, we are introduced to a portion of John's predicaments. This first third of the novel is complete, and undergoing its requisite editing. Parts Two & Three are in progress. ﻿The Boy with the Golden Heart, Part One﻿ is available in the lending library of ﻿Amazon Kindle﻿ or available for purchase for 99¢. 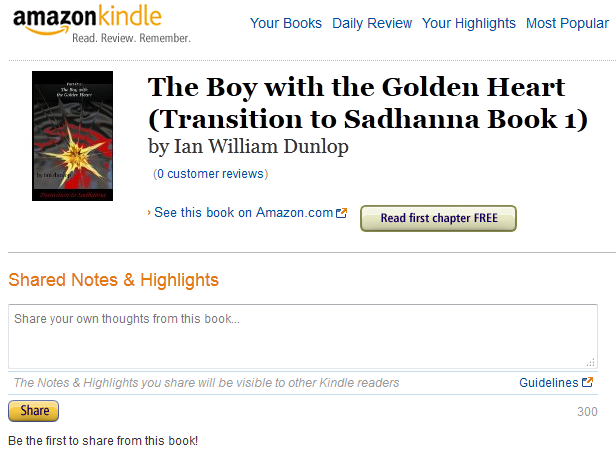 The image below is what the Amazon Kindle Sharing Page looks like: Click anywhere in the picture to go there.